Rediff.com » News » Why did Modi skip the Jallianwala centenary event? Modi's absence from an event to mark the centenary of a definitive moment in Indian history puzzles Utkarsh Mishra. The Indian Army commemorated the centenary of the First World War from March 10 to 14, 2015. Prime Minister Narendra Damodardas Modi laid a wreath at the Amar Jawan Jyoti on March 10, 2015 in honour of the nearly 1.5 million Indian soldiers who fought in the war, on the anniversary of the Battle of Neuve Chapelle, the British offensive in France in which the Garhwal Brigade and Meerut Division of the Indian Corps participated. A month later, in April 2015, while on a visit to France, Modi visited the memorial at Neuve Chapelle. There, he mentioned the contribution of Indian soldiers in both the World Wars. Last year, Vice President Muppavarapu Venkaiah Naidu represented India during the Armistice Day centenary commemoration in Paris. We may herald stories of Indian valour in the Great War and our prime minister may like to stand alongside current leaders of the Allied countries, but we forget that most of these Indians were forcibly recruited to serve in the war. Others supported it in the hope of substantial concessions by the British at the end of the brutal conflict. What they got instead was the Rowlatt Act of 1919, severely curtailing the civil liberties of Indians. It was a peaceful protest against this very Act at Jallianwala Bagh in Amritsar that General Reginald Dyer and his troops of the 1/9 Gurkha Rifles exhibited the utmost cruelty. Punjab was then under martial law and Indians were often made to crawl on their bellies in front of the English in the lanes of Amritsar, still called the Crawling Lane. It came as a surprise that the Jallianwala Bagh centenary received a lukewarm response from a government that commemorated the WWI centenary with some fanfare. Yes, there was an event in Amritsar in which the vice president released a commemorative coin of Rs 100. But somehow, the omnipresent prime minister gave the event a miss. Why? Modi was campaigning for the Lok Sabha election in Tamil Nadu and Karnataka and, unlike British High Commissioner Sir Dominic Asquith, he did not find the time to travel to the Jallianwala Bagh memorial in Amritsar to mark this important anniversary in recent Indian history. A day later, he may have anticipated an attack from Congress President Rahul Gandhi and Punjab Chief Minister Captain Amarinder Singh who both visited the memorial. So at a poll rally he pre-empted such salvos by saying that the captain was not present at the official event and instead preferred to accompany Rahul Gandhi later to the memorial. But why did Modi, who likes so much to be a part of events of national importance, not visit the Amrtisar memorial? Was it to avoid the debate of seeking an apology from Britain? A week earlier, British Prime Minister Theresa May 'deeply regretted' the massacre and called it a 'shameful scar' on British history, but she did not apologise for the colonial crime. Her stand was no different from her predecessor David Cameron who, in 2013, became the first serving British prime minister to voice regret over the massacre. It is a long-standing demand by many in India, especially the Sikh community, that Britain apologise for the Jallianwallah Bagh massacre. Then prime minister Inder Kumar Gujral mentions in his autobiography Matters of Discretion that in 1997, while in London, he told the media that Queen Elizabeth II should not visit Amritsar during her visit to India that year owing to the Sikh demand for an apology over Jallianwala Bagh. However, he discovered 'to his surprise' that the Akalis rejected having any such demand and instead expressed keenness that the queen visit the Golden Temple. Gujral says he had to retract his remark 'under pressure' and say the queen was free to go to Amritsar. That was the closest, I think, an incumbent Indian prime minister spoke on the apology question, for which he was rebuffed by his own countrymen. In the Modi era, the demand for an apology and reparations for colonial excesses were renewed by Congress MP Shashi Tharoor in his Oxford Union speech of 2015. 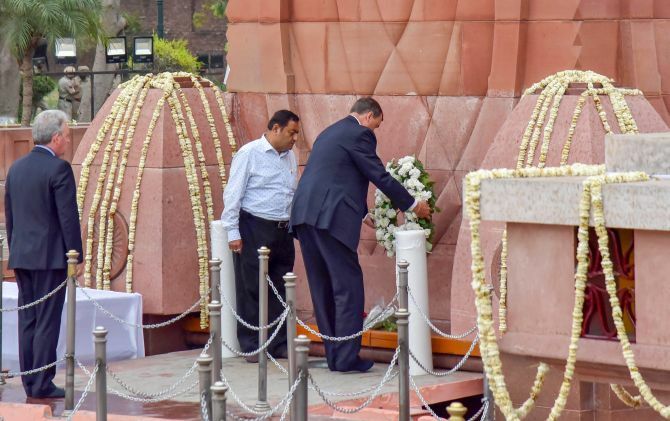 Citing the example of then German chancellor Willy Brandt genuflecting in front of the Warsaw Ghetto, Dr Tharoor said the British royal family should do something similar at the Jallianwala Bagh memorial on the 100th anniversary of the massacre. During her 1997 visit, Queen Elizabeth visited the memorial, but she has not expressed regret to date over the incident. Modi too has remained silent about a British apology. Could it be because he cares about his image in Britain so much that he would not like to stir the pot, especially during election season? The Koh-i-Noor episode is a case in point. During his 2015 visit to the United Kingdom, many wanted Modi to ask Britain to return the diamond to India. In the past, the Indian government had demanded the return of the diamond twice -- in 1947 and 1953. Both times, it was rejected by the then British government. In 2010 and 2013, Cameron rejected the return of the diamond. Modi's government told the Supreme Court that the Koh-i-Noor was a 'gift' to Britain from India, but later sought to modify the statement after facing sharp criticism. The government said Modi was determined to bring back significant pieces of India's history and blamed its earlier stand on (surprise! surprise!) Jawaharlal Nehru, saying the comments referred to the latter's views. It is possible Modi thought that attending the Jallianwala Bagh centenary could distract from his election campaign and give likely fodder to the Opposition for the government's past dilly-dallying on colonial reparations. But no one can disagree that the centenary event merited the prime minister's presence, and his absence is a telling admission of his government's position on history when it does not suit its own crafted narrative.